Want a fun, easy dessert for this evening? Here you go . . . I made a sugar cookie recipe and baked it in a bar pan until done. Now, you can just do that according to your normal, favorite recipe. Or you can go buy a roll of sugar cookie dough and roll it out in the pan. Or you can do what I did: modify a recipe so everyone in your family could eat it. My modification? Instead of flour, I used a half and half combination of Pillsbury Gluten-Free flour blend and almond meal/flour. I chose the half and half because with the Pillsbury brand, I have found the cookies crumble really easily. Adding the almond flour really adds some strength and some flavor. Spread that over the cookie as thick as you want. Add fresh fruit. I added washed and dried blueberries and strawberries. We will eat it after lunch. Yum! I shared this recipe with a LinkUp at A Net In Time, so you can hop over and read some other great recipes… I know there is a great one for Lemon Loaf and one for cookies that are flour-free! Two of the giggly girls were selected to dance roles in The Nutcracker ballet when it was performed locally. Miss J performed an angel role and Miss L performed a soldier role. While it was a lot of work over several months, they enjoyed the opportunity immensely. The final performance was wonderful and the experience of working with a professional company made it invaluable. Miss L wants even more to grow up to be a ballerina now. Since the local symphony only performs The Nutcracker Ballet every two years, it will be a while before the girls have a chance to audition once more. I am glad they can savor the experience for a while and be proud of the work they put in. Here are a few of the dress rehearsal shots of the girls in costume. We will watch a DVD of The Nutcracker tonight and enjoy all of the dancing and costumes. Happy Halloween to everyone. Yes, we enjoy dressing up and having fun. We spend time with friends and family. We play games. We enjoy just being who we are (or maybe who we are dressed up as). We don’t worry about the implied connotations that others try to place on this day. We don’t stress about what others may think we are condoning or approving by dressing up as fun characters and sharing the day with others. We celebrate being alive another day and living the life God gave us. We dress up for dance classes. We dress up for trunk-or-treat at church. We dress up because it is fun. We dress us because we like to see how well we can make our costumes. We just enjoy having fun. Be like a kid and just enjoy life. And, since this is Monday, I’m tying it into my common Middle School Monday post. These costumes are almost completely made by the girls. Miss E did the sewing for her minion outfit using fabric we had in our stash. We did buy the yellow shirt but everything else came from the house. Miss L was given the butterfly wings for her costume. Everything else she put together from her closet. Well, except for the antennae headband. We didn’t have a dark headband or black pipe cleaners so we did buy those so she could make antennae. Miss J is Astrid from Race to the Edge. She cut out all the pieces for her costume and she sewed the skirt. I did the hot gluing for the studs on it, which we bought. She made the shoulder covers and the necklace. Her sister made her the ax. We did have to buy the shoes but she was due for some new ones anyway that would keep her feet warm so it fit right in. And there you have it – the costumes the giggly girls made for having fun. Funny . . . silly . . . full of fun. The The Familyman’s Christmas Treasury – Audio Collection will cheer your family this holiday season while ushering in the spirit of family fun. 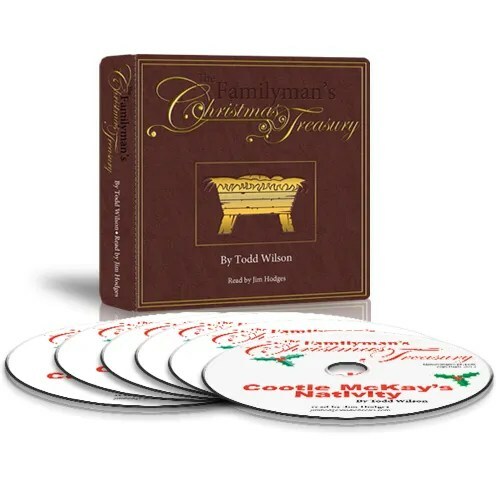 Brought to you by The Familyman, Todd Wilson, this collection of holiday tales will brings gales of laughter to the entire family. The Christmas Treasury is a set of 6 holiday tales written by The Familyman himself. Available either on CD or as Digital Downloads, these tales will thrill the listeners as they giggle at the man in town who sits in trees and chats with squirrels, live through memories of Christmases past, quake at the sound of a knock at the door, or become a super hero who changes the world, and not for the better. The Familyman, Todd Wilson, is a well-known name. Focusing on the mission “to remind dads of what’s most important” is what The Familyman does. Whether it is through speaking, audio, or writing, Mr. Wilson’s humor, experience, and straight forward talk makes him a favorite. He has written books such as Help! I’m Married to a Homeschooling Mom and appears as a guest with Focus on the Family. His wit and humor come through clearly in The Familyman’s Christmas Treasury. The Treasury tales are Captain Chaos and The Manger Blaster, Cootie McKay’s Nativity, The Stranger, The Bishop’s Dream, Harold Grubbs and the Christmas Vest, and Gladys Remembers Christmas. We also received It’s Called Christmas and The Secret of Snow Village. We received all of these as digital downloads and also Cootie McKay on CD. Captain Chaos is a story of what you probably expect from the title: a superhero who is not so super and creates chaos for the young boy of the story at Christmas time. The story was fun and we laughed a bit, though it is certain to be appreciated more by boys than by my giggly girls. This story was quite a discussion starter and gave us a chance to talk about biblical salvation. We also had the opportunity to talk about denominations vs what the Bible says. Gladys Remembers Christmas was a sad but thoughtful reminder of our blessings. Gladys was cleaning out her childhood home when unexpected finds brought joy to her life once again. This story of traditions and memories was a sweet reminder of how one small thing can spark wonderful changes. The Stranger challenged us to live by Jesus’ words and example. One by one, the members of the church turned away the stranger who came to them. A door was finally opened to him on Christmas Eve and that brought suprises, beautiful ones, to that family. Miss J said, with heartfelt enthusiasm and relief, “I’m glad someone finally let him come in!” It was a lovely story about entertaining angels. Cootie McKay’s Nativity was probably my very favorite. I listened to this hilarious story more than once and I laughed pretty hard each time. In this story, the town’s nativity needs replaced (the reason is hilarious so I’ll leave that for you to listen to) and Cootie McKay is the one to do it. What starts as a way to let Cootie know what is needed for the nativity turns into a study of the Biblical account of the nativity and a study that touches the heart. This story had several meanings for me: people rise to meet a challenge, there is great joy in God’s word, and do not underestimate the power of God’s word. Harold Grubbs and the Christmas Vest was a beautiful story about how God touches our lives through others. When Harold Grubbs chooses to change his life and follow God, the whole town is surprised. His change touched everyone and his Christmas Vest became a yearly reminder of God’s ability to touch life. This was a very pleasant story and I enjoyed it very much. It is another opportunity to talk with our children about Biblical salvation. These are wonderful family stories that will prompt laughter right alongside thoughtful discussions that will grow your family in God. Be prepared to discuss and correct Biblical teachings. There are references to various denominational churches and that salvation is received by “asking Jesus into your heart.” Because these are not Biblical teachings, we did not let the girls listen to these without a parent the first time so that we could guide and teach them according to God’s word. These are teaching and learning moments so don’t let that keep you from considering the purchase of this collection of wonderful stories. The Familyman’s Christmas Treasure is a lot of fun; we have really enjoyed the stories and the laughter. This is a great product to bring your family some fun time together this holiday season. Want to read what other Homeschool Review Crew families thought? Click the banner below. 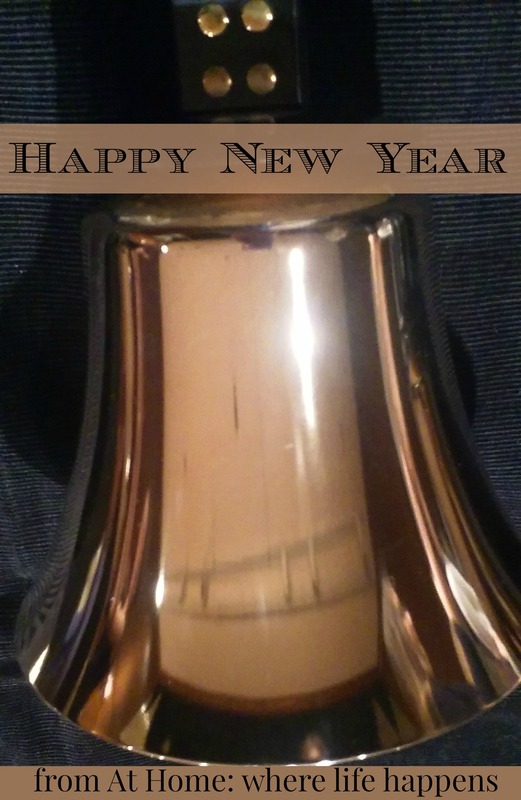 As your new year begins, our family wishes you hope and joy and peace. 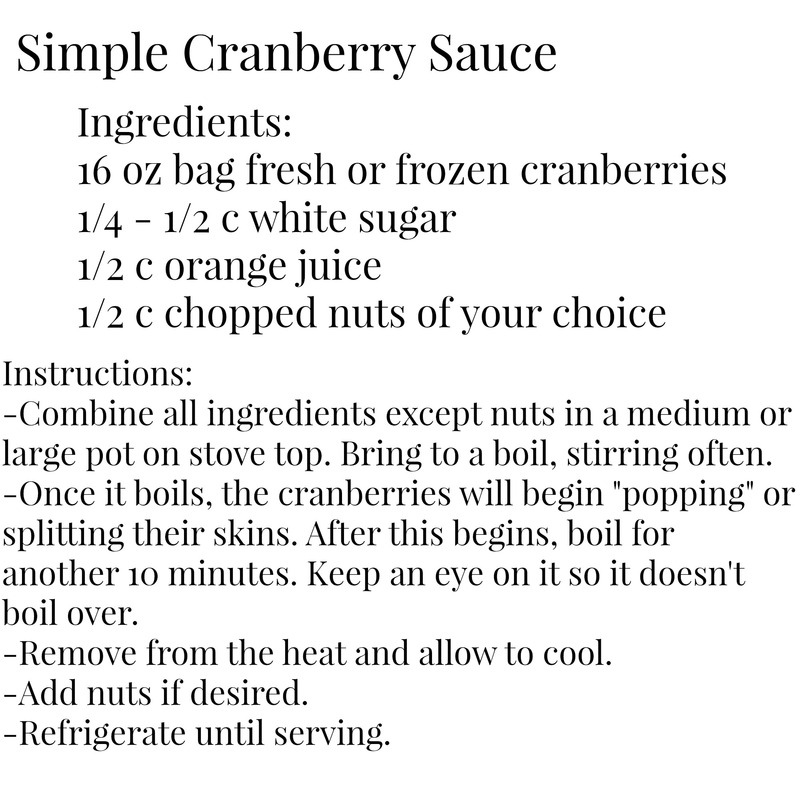 I don’t know about you but the holidays aren’t the holidays without some yummy cranberry sauce. Now, let’s be clear about one thing. If it comes in a can and stays in that shape, it is NOT cranberry sauce! Cranberry sauce starts with cranberries. The real things! Add some orange juice and a little bit of white sugar. Simmer and voila! Cranberry sauce! Seriously – it is that easy. Miss L is the one who enjoys cranberry sauce as much as I do and it is now her job to make the cranberry sauce for meals. She is pretty good at it. And I sure do enjoy eating it. In fact, since it is so hard to find cranberries during the year except in November and December here in Texas, I buy several bags and put them in the freezer. That way we can make lots of cranberry things, including yummy cranberry sauce, throughout the year. I won’t leave you without the simple recipe, though. For a printable copy of the recipe, click below. 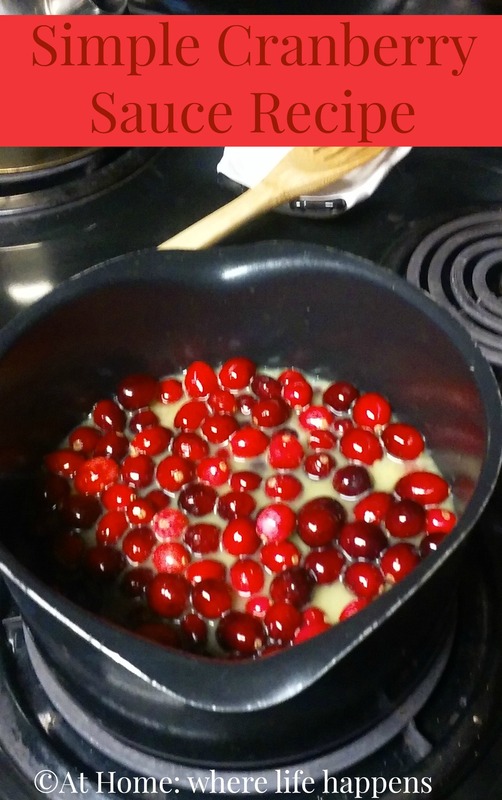 Enjoy making fresh, yummy cranberry sauce.